Dwarf food isn't so bad when you get into it. Unusual, but not unpleasant. On the downside dwarves only drink ale, and I wasn't going to request something else, that'd be rude. There were about two-hundred dwarves dining with us, and the atmosphere was loud and boisterous. As the centre of attention of so many people, I mostly picked at my food, and sipped my drink and tried not to make a fool of myself. A lesson learnt, sipping beer while worrying about something else is a good way to get drunk. The dwarves had very deliberately seated us in the following order along the high table: Me, Marigold, Ayeena, Terato, Argent, Vincent. The chief of the dwarves was on my left, and then the party were to my right with a dwarf between each of us. I have no idea why they chose to seat us in this order, but it seemed important to them at least. In addition they had declined to provide us with knives, assuming we'd bring our own. My previous guess about the difference between Halt and Rest had been pretty close. It turns out that they do all believe the prophecy of the ice maiden. The dwarves summoned their loremaster to recount the saga of the history of their peopel. It turns out that I am the fourth ice maiden to appear to their people and match the properties in the prophecy, (although I apparently do better than the previous ones.) - When the first ice maiden (a human) appeared, she told them that this place was their home, and they began to build up a more permanant mine in this place. When they dug down deep enough, they encountered these fire creatures they are so afraid of, and the ice maiden led them in battle, and perished. The dwarves of rest believe this was a sign that the true subject of their prophecy was yet to occur. The dwarves of halt believe that this was the end of the story. Nevertheless, these people are plagued by the fire creatures they fear so much, and I felt compelled to promise that we would do everything we could to help them. The others didn't seem too happy about this. When I realised I'd made a promise on behalf of the party again, I felt a bit guilty. The meal didn't seem to have a defined "end' as such, and while the others drifted off to do whatever they felt they needed to do that evening, I stayed in the dinner hall, talking with the people, and assuring them that we would do whatever we could to relieve them of their plight. I think after a little while, they'd decided that I was some kind of mother ot their people, and that I was staying in the great hall to listen to their troubles and give them comfort. I can't remember how long I stayed there, but I awoke still dressed in a comfortable dwarven bed somewhere else in the citadel. Today, we go to war. Our enemies are called the Azer, fireborn dwarves who know only evil. At their command they have a lage number of troglodites, imps and kobolds. The others have read of these Azer, apparently even one of them would be too much for our group to handle. We can't simply walk out of the citadel and defeat them like we have our enemies in the past. Realising that we were up against more than we expected, we attended a war council with the leaders of the dwarves. They showed us a model of the entire citadel and all their mining, in order for us to more easily make plans. I've copied down a sketch of the diggings from a side-on perspective. There are apparently three Azer in their hall at this time, but they are using theirminions to dig outwards and find more. The Fire-dwarves apparently have some way of reawakening the bodies of their fallen companions, although it takes a while. Within a week there will be four Azer, and then our task will be that much more difficult. 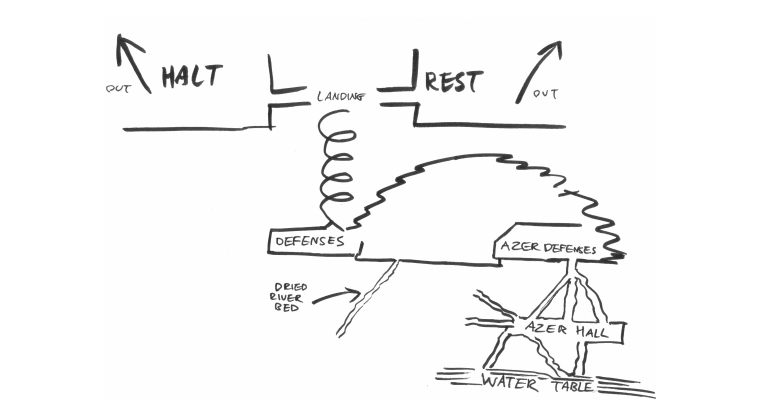 If we could force the Azer to attack our defensive point, we'd be able to take them. There would be huge casualties, but eventually we'd win out. as it happens, we don't ahve any good plans for forcing them to attack anyway, and even if we did that'd be no good. In the end our plan is fairly simple. If we head down the dried up stream, we should be able to make our way to the water table. From there, we can get below the Azer hall, and set several runes that can cause a cave-in. The dwarves will be able to set these off remotely, and they have granted me the ability to do this as well. Hopefully, if all goes according to plan, the tunnel system will cave in entirely onto the Azer hall, and bury everything. If not, they'll at least be buried for so long that we can safely leave Rest without fear of being followed and attacked from behind. The dwarven tunnels are apparently high enough up and stable enough that colapsing everything around the Azer hall wouldn't affect them. Heading out the bottom of Rest, we travelled through a series of defensive tunnels to a large fortified pallisade where a guard waited with crossbows. In front of the way was a large spiral staircase without railings, heading down into the depths. It was a long way down. On the other side of the landing there was a similar fortress, where the dwarves of Halt also had a guard, although they were armed for close combat rather than ranged combat. We spoke briefly with their elders who made it quite clear that they didn't consider us to be part of any prophecy, but when we offered our plan to fight the Azer and explained what we were going to do they at least acknowledged our courage and wished us luck. Their chieftain told me that even if I wasn't the girl from the prophecy, he wasn't an idiot, and he'd be glad to help us in any way he could. I gave him a hug before we set off, I'm not sure why, it seemed like the thing to do. Getting to the bottom of the staircase, (it was a long way down,) we made our way through a second set of fortifications, mostly traps. Here the dwarves of Rest and Halt sat together, united in their duty guarding against the forces outside. In the distance we could see troglodites and kobold taunting the dwarves, but they kept their distance. Under the guise of sending a party out to reset some traps, the dwarves escorted us to the mouth of the dry stream, and we made our way inside, and past the traps that waited there. We bade the dwarves farewell and ventured down into the gloom. In fairly short order, we came across an entrance to the Azer tunnel system, a guardpost connected to the dried up riverbed. The place was guarded by a squad of troglodites and a few flaming bats. We ambushed them, and with Tyrael baying for the blood of his natural foes I surged to the fore with the others. Spotting me, one of the mages turned and summonned a thick metal chain out of nowhere, snaking it around my neck, to choke me. I struggled against it, but it was wrapped too tightly, and I couldn't escape. Some prophetic hero I am, My entire contribution to the battle involved blacking out.